Dec 19, 2016: SSD from my Desktop and Connect it to my laptop? Dec 19, 2016: Use Desktop SSD with Laptop? Dec 31, 2016: Any idea where I can buy a SATA to USB converter in the Sinchon area? Jan 08, 2017: Windows 8 pc won't boot correctly. Feb 08, 2017: psa: you can use basically any hard drive, internal or external, as a storage device for xbox if formatted correctly, even if it's already been used for something else like a Mac. Feb 20, 2017: Optical drive in a computer case with no room? Feb 22, 2017: Bought a new t460p, how to move Windows to new SSD? Mar 29, 2017: My old iMac died (light board crashed) but the hard drive should be fine but when I try to transfer to my new iMac, my new computer won't recognize it. Help! Apr 10, 2017: Selling my MacBook, what do I need to get from it to make a hackintosh? Apr 18, 2017: For Destiny 2, I do hope the menus load faster and will not be kicked out of them. May 05, 2017: Removed hard drive from PC, and need to hook it to new PC to get pics off it. May 20, 2017: Dual SATA to USB adapters: what kind of set up do I need? May 28, 2017: Mini HDMI out, sweet. May 31, 2017: About take the plunge, but first, am I going about this the right way? Jul 13, 2017: Any way to get into a Laptops storage unit without it being on? Jul 17, 2017: Replacing dead motherboard, will I still have my old files? Jul 20, 2017: Test SSD without booting into windows? Jul 31, 2017: How to read internal hard drive externally? Aug 13, 2017: [Peripherals] Looking for a way to get the USB header on the front to work with this MB, maybe with a SATA to USB 3.0 converter or USB 2.0 to USB 3.0 converter. Aug 15, 2017: Using Tine Machine to clone HDD to a new SSD? Aug 23, 2017: Wet Laptop - Is There Any Hope? Sep 03, 2017: Anyone here know a lot about m.2 hard drives? Seeking info on how to determine what model enclosure I need to be able to access my HD. Feb 13, 2018: Need a USB cable to convert a CD/DVD-ROM or BLURAY player that once was internal to external, help? Feb 24, 2018: Computer Died. Buying a new one but I want to get data off my old internal hard drives via USB. Can I get files off my boot drive? Mar 25, 2018: My 2011 Macbook pro is too slow for me to fix. Help! May 05, 2018: Malicious party had unrestricted access to computer, how do I get files off safely? May 08, 2018: Emptying old hard drive. Sep 04, 2018: Do I need this for my SSD? Sep 22, 2018: What is the name of this port? Nov 02, 2018: Help, I want to install an ssd to laptop. Need help transferring files over. Nov 08, 2018: Would this usb 3.0 to sata work to recover dropped 2.5 laptop hdd? Dec 06, 2018: Water Damaged Laptop, Need to access Data. 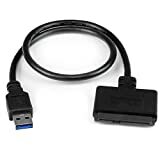 Dec 08, 2018: Installing windows using sata to usb cable? Jan 12, 2019: Can I install Windows to a new SSD using a USB to SATA 3 adapter? Awkwardly worded question - details inside. Jan 19, 2019: New ssd not detected? Feb 12, 2019: Would this be powerful enough for N64, maybe Dreamcast? Feb 17, 2019: Tech Expert, anyone? Recommendation? Apr 19, 2019: Linkdump, useful nano purchases.